Delicious gluten free and paleo home made recipes from my all natural kitchen. I have tried multiple grain-free pizza recipes and could never find a great one. I experimented with a few ingredients and voila, I came out with the most delicious grain-free pizza ever! These are so easy to make and cook so fast! Enjoy! Preheat oven to 400 degrees F. Whisk the eggs, water, herbs, and parmesan. Add the coconut flour slowly until it is a thick batter. Spread the batter in small circles on a baking sheet. Pat down the dough to desired crust thickness (I would recommend thin because I thought my crust would be thin, and it ended up being so thick it took away the taste of the toppings). Bake in oven for 10 minutes. 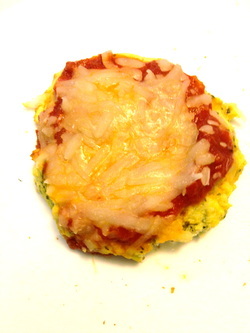 Remove from oven, add toppings, and bake until heated and cheese melted (about 5 minutes). Having Celiac Disease, you and I both know I have many digestive problems..I decided to make a green detox smoothie to help detoxify my digestive system. Yes, this smoothie is green, but it tastes like a sweet and tropical drink you would buy in the Bahamas. 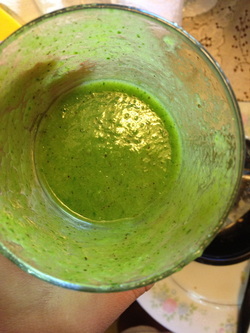 Next set your blender on liquify and let it go for about 2-3 cycles or until all ingredients are blended smoothly. Pour into a glass and enjoy! The detox worked instantly for me and I started feeling better. This one’s a keeper!